You must make reservations at least 5 minutes in advance of the time at DISTRICT. A dining & drinking democracy founded on uncompromising quality and an element of surprise offering seasonal Californian cuisine & cocktails that dazzle the senses and intensify connection. DISTRICT’S design philosophy mirrors its deliciously unexpected approach to food and drink. The resulting atmosphere is a marvelously curated art meets craft, past meets future vibe that is wholly enticing and utterly original. A friend and I stayed at the Sheraton Grande for a girls weekend away. It was her birthday. 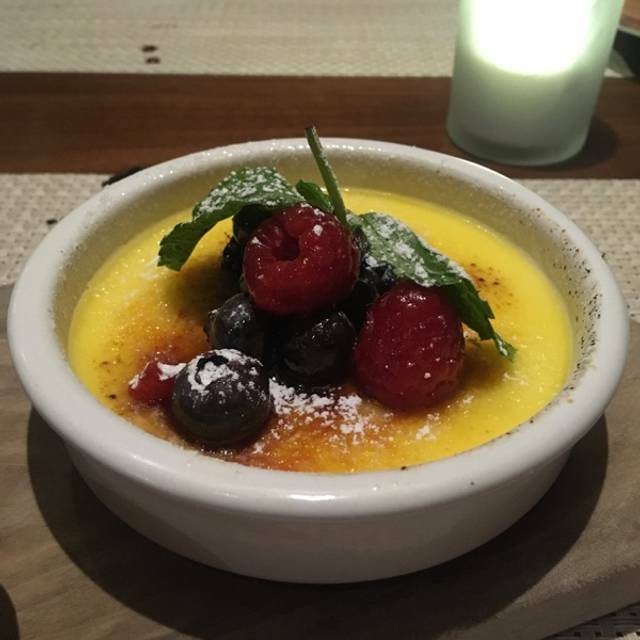 We ate dinner at the District and the food and service couldn't be better. The waiter was very attentive and gave us great advice as to what to order. I had the brisket which was so tender it cut with a fork. 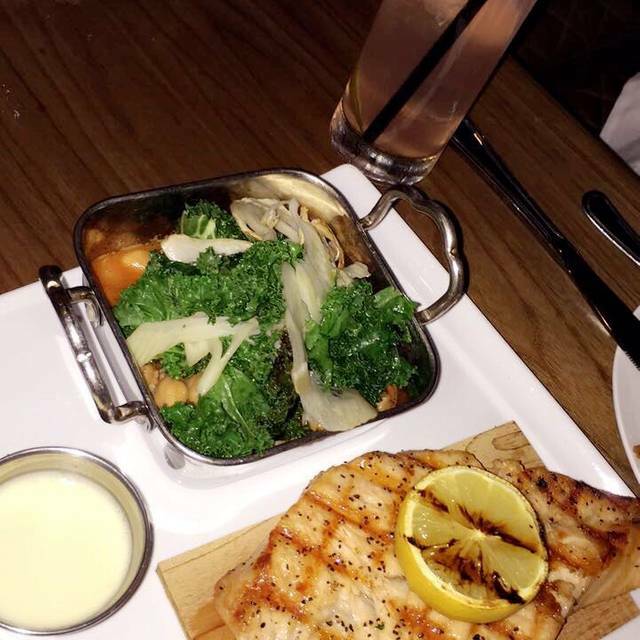 My friend had the salmon which she thoroughly enjoyed. The sweet potato fries were terrific. Then the waiter brought us an incredible flourless chocolate cake, free of charge, for my friend's birthday. It was decadent and so good. We also had breakfast there the following morning. The food was again great and the waitress was incredible. She refilled coffee often and even asked if we wanted a cup to go when we left. Very polite staff and outstanding drinks. Delicious food choices and good portions. I guess I didn't really get it. 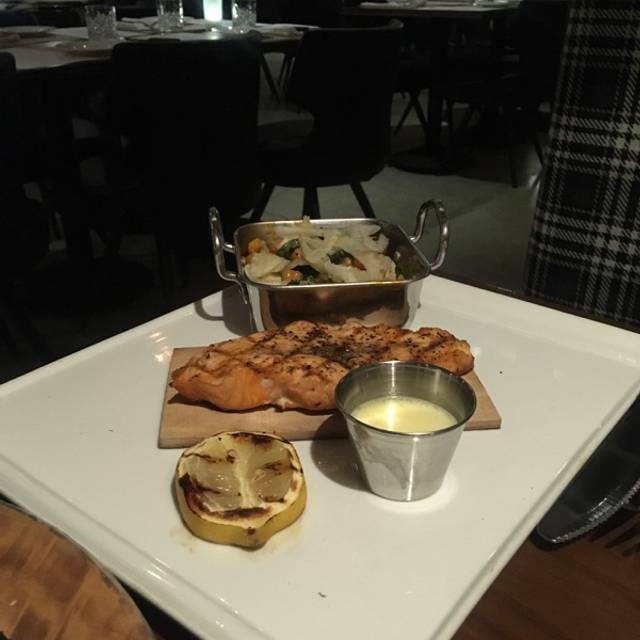 Food was served on fairly deep white trays rather than plates. Felt like a school meal where someone forgot to use a plate. Service was a little over-the-top. Being asked "May I?” Every time something was picked up or put down just seemed pretty pretentious and unnecessary. We also didn't particularly like being called 'young man’ and 'young lady’ when we were at least same age as the server if not older. My wife did think the Salmon tasted really good but she didn't each much of the accompaniments. I had half chicken which leaked grease into the tray and tasted of nothing. The whipped potatoes and roasted vegetables in their own little dishes would have fed a hamster. 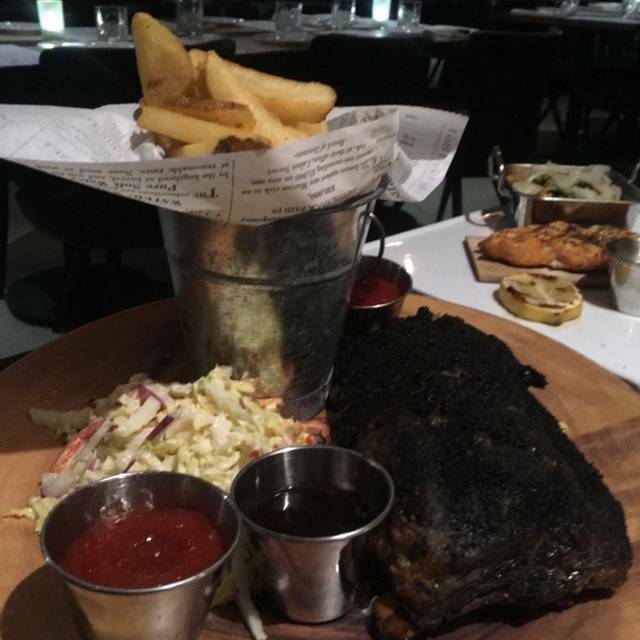 Apparently the steak (NY Strip) tasted good but it was tiny. The cauliflower was okay but really something and nothing. The bread and butter pudding dessert was good though and so was the NY Cheesecake. My wife ordered the chocolate torte but couldn't eat it as she has a nut allergy and it seemed that it may have had nuts in - we weren't confident and so she left it. No-one came back to check it was alright until the bill was brought despite the fact I hadn't asked for it. We had breakfast in the same place the next morning (we were staying in the hotel) and it was pretty good tbh. I would not make another trip there though. Not sure if it's because it's in a mall in DTLA, but this place should be a lot more crowded. Excellent food, excellent service and very cool atmosphere. Highly recommended. Would NOT recommend. The food selections were very limited. We were there at 6pm on a Saturday night and they were already out several of the food items. The service was very good and our waitress, Brittany, was particularly friendly, charming and solicitous. But the food overall was a big disappointment. While the fries were perfectly salted and crispy, the kale cobb salad was underdressed and hard to eat, due to the giant-sized kale leaves stuffed into a too-small bowl. Every time I tried to cut and make a forkful, the kale leaves would spring out and shoot bits of dressing or various cobb toppings in every direction. The kitchen clearly does not know how to work with kale (a shocker in 2019 SoCal, no? ), as the staff put whole kale leaves in the bowl. The hard, chewy spines should be removed from each leaf and the remainder of each leave should be cut into more manageable, ideally bite-sized pieces. So maybe if the kale itself hadn't been such a tussle and a struggle to deal with, the salad would have been OK. But again very underdressed and also the shredded chicken was dry and stringy. I'd try District again, but only for convenience - it's not a food destination. 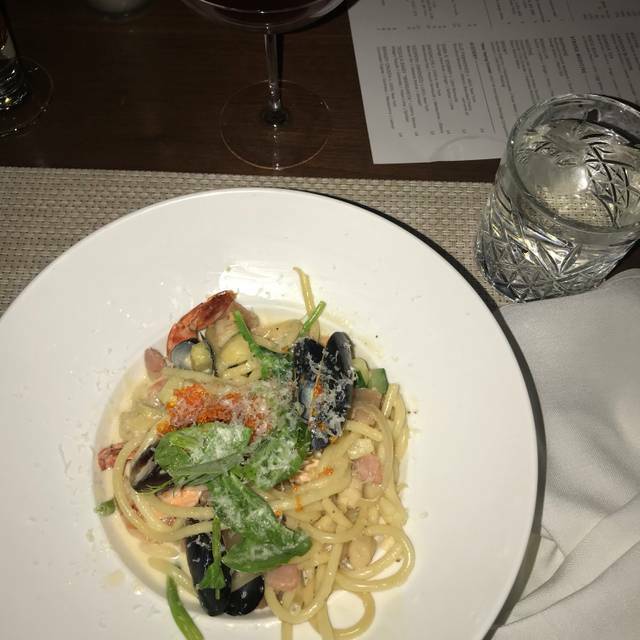 After confirming by phone in advance that gluten free dining could be accommodating and making a reservation to dine before a Laker’s game, was told that dinner menu was not available until 5, that my reservation should not have been possible, and that gluten free was “hard.” What a joke. Very good and fun. Server was funny and excellent. Excellent spot (dining area in the back), for business lunch/dinner and/or happy hour in the front. It was our 6th wedding anniversary and we wanted to do something not too fancy but not too casual either. I think the District hit the mark. It was our first time here. The ambiance was great nice and quiet. The food was good. My husband had the pulled pork sandwich and he loved it. I tried the butternut squash bisque and I enjoyed it. I also the ribs and they were just ok...a little too dry for my taste and a little bland. The mashed potatoes were good but the coleslaw wasn’t that great. But overall I didn’t hate it. The service was very slow, they only had 2 waiters. The place wasn’t that busy but they had a big party which made our server take longer to get to us but she was very apologetic and treated it us really good. We did have somebody come to us,maybe the manager, and apologizing and made sure we had our drinks promptly. I had the beetnik( I think that is what is what called) it was delicious to me. Overall I had a really good time. Staff was really nice congratulating us on our anniversary and we had a free dessert, a cheesecake and it was very good. I wasn’t disappointed. We came for a family birthday and the service and attention made us all feel so special. Everyone from the hostess, the gentleman making sure our water glasses were always filled, and the waitress and waiter, were warm and attentive. We will certainly be back. Thank you all so much for helping make our night so lovely!!!! Construction noise was very disruptive. Service was great but the noise took away from the experience. People had a hard time talking between drilling. Food was delicious and the service was better than excellent. It was really good for conversation. Restaurant was not busy on a Saturday night. Food took quite a while to come out but the service was very good. Seems to be a bit of a weird location. Overall we really enjoyed it. Had dinner for six here the day after Valentines. Everyone enjoyed their meal. Service was excellent. We were not rushed. Parking available in the structure and they validate. Would definitely come again. I don’t know what to say here. The food was kinda just... uninspired. The service was nice enough but a little intense and in-your-face. Not bad... just... a lot. And here’s the thing... I know it’s cute to serve food in alternative ways... 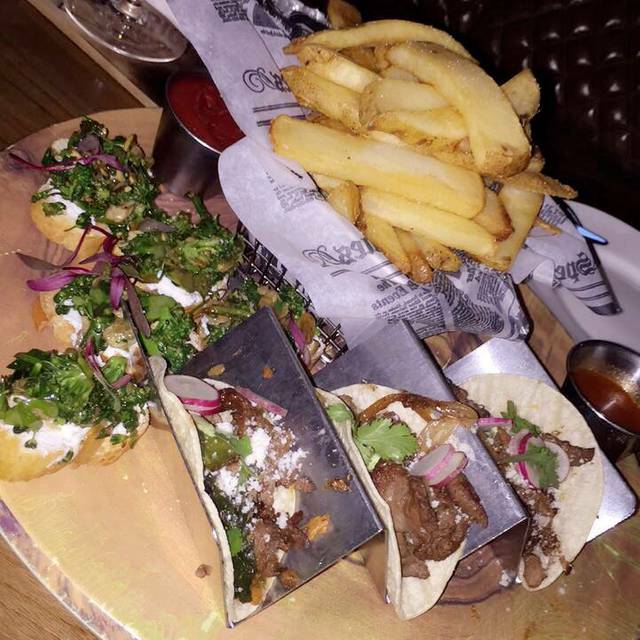 I just don’t want to be served in a giant, deep metal tray. Makes me feel like I’m either on a plane or in a retirement home. I was hoping for better, but sadly we found it to be an overall disappointing experience. Celebrated my moms Birthday. Food was great. Cocktails were terrific too. Perfect service. Great value. Highly recommend “District!! Something was up. The energy of the staff was weird, food took almost 2hrs to arrive and when it did it was awful. Pretty disappointing overall. A bit disorganized or understaffed but waiter worked hard to try to give good service...the manager came in and helped...but the effort was great. The food was delish and the service was outstanding! Totally recommend this place. They offer validation for parking so that is a plus! First time to District and choose it out of the DineLA listing. Loved how the décor was rustic with high ceilings but very cozy like you're in someone's private library lounge. The staff was very friendly and helpful. The craft cocktails were amazing, and the waitress was on point in helping select exactly what I would like. We got the family dinner, which we shared a salad, corn bread (with actual corn in it), 3 selections of meat: rub ribs, briskets and pork belly, and the meats were so tender it can be cut with a fork! The kimchi fried rice was flavorful, and everything was wonderful except for the mac and cheese which was a bit blend and not as "wow". 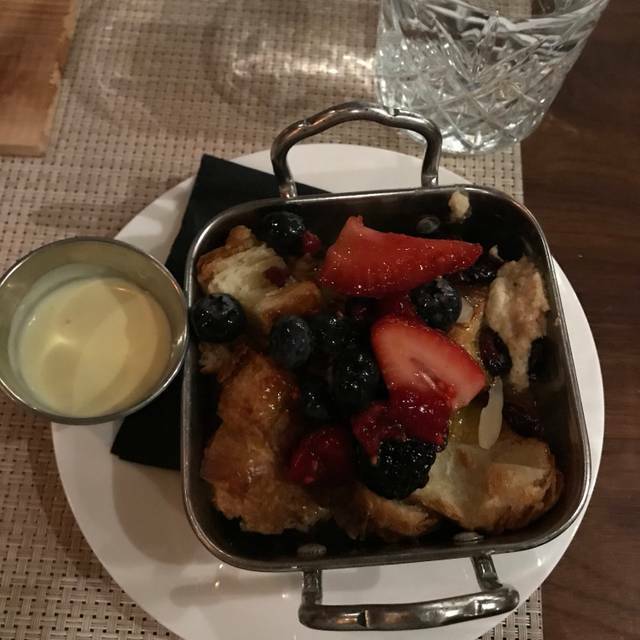 The bread pudding was mouth watering, and overall the quality of food was top notch along with the service. We would highly recommend this place and come back! Drinks are great and creative. Restaurant food was okay. A bit disappointed in the ribs because they were tough and dry. Not being able to split bills up for a multiple party table is not convenient for guests. Went to district on new years eve, it was a good crowd not full but not empty. The food was amazing but the service was lacking. Third visit this week. Cocktail was terrible. Replacement was better but strong. Got the most expensive steak on the menu. It was half fat and gristle. Cocktails were classic and very well done. Food was excellent. Only issue I had was menu was different then that shown online in the app. I know menu changes with seasons. But should change the online menu too. Restaurant was empty for a Thursday night. Parking downtown is subsidized by the restaurant which is appreciated. Bar is nice and was full. Service was very good. In Macy’s mall downtown so good for lunch I would think. Our hostess was the sweetest! She was so fun and easy to talk to and even recommended some bars for us to check out after dinner. Unfortunately I can’t say the same about our waiter...he was inattentive, unfriendly, and frankly a little rude. Other than him, our experience at District was amazing! 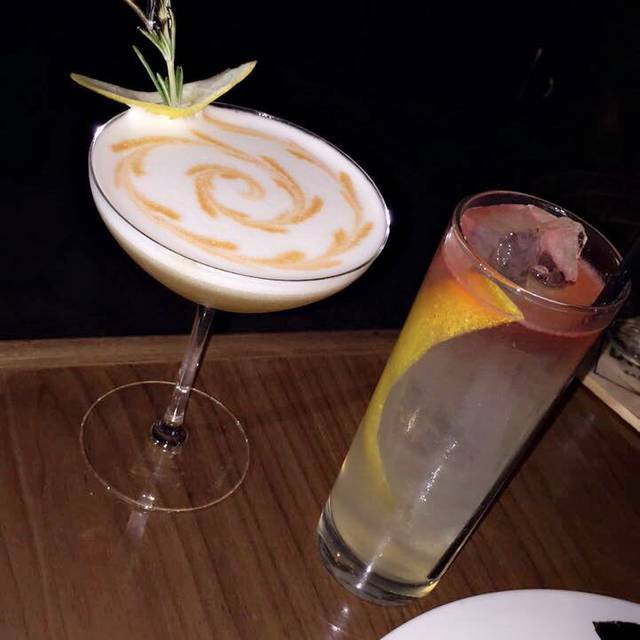 Unique interior and ambiance, professional service, fantastic craft cocktails, food is perhaps the weakest point but still very good. Nothing in this place is bad. Price sneaks up on you but would still highly recommend. 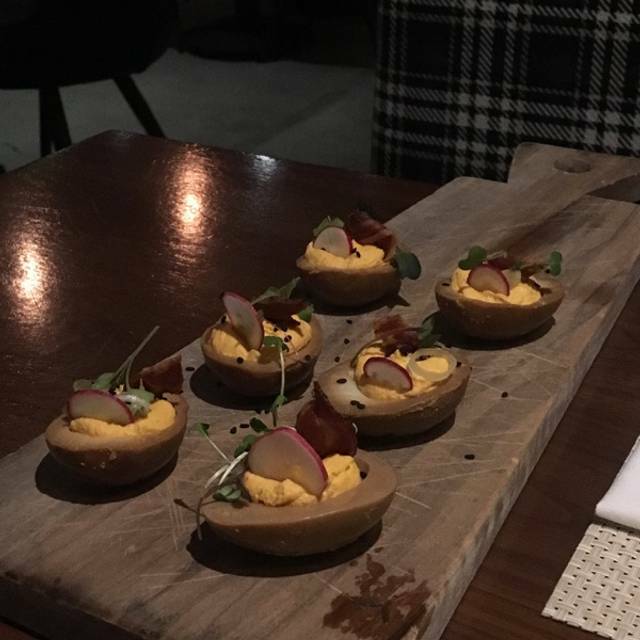 Nice appetizers! Very well balanced and awesome flavors. Main course had less of a wow factor. Service of Brittney was attentive. She was not there when we asked for the check and got a bill-mess up. Overall nice place! We had a great time for our party of 5. Our server Victoria, did a great job and was great to all of us, especially the birthday recipient. Food was great would definitely eat there again. Great food , no doubt about it . But they took 45 minutes to bring out drinks and the starters never arrive. Overall was good food .